Are you ready to ingest MASSIVE levels of cuteness? 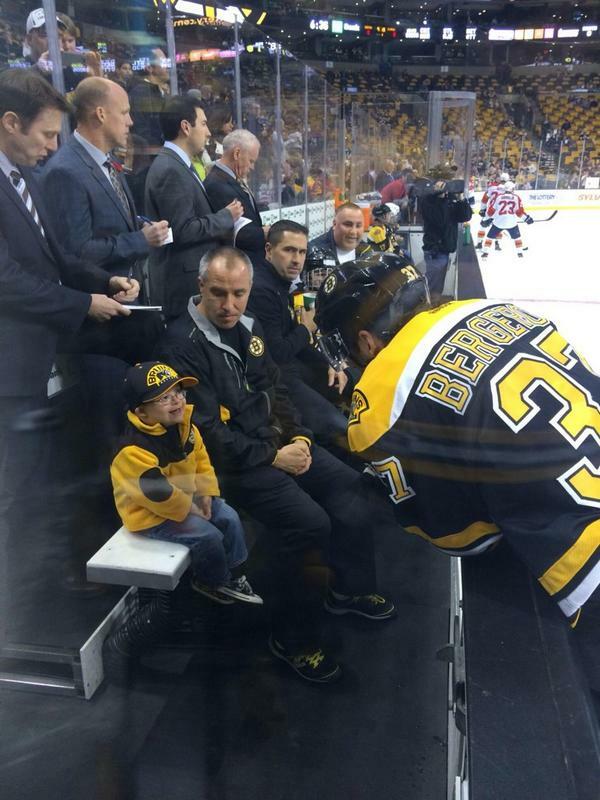 Okay then….watch as a young little fan fist bumps the Boston Bruins players after their pregame warm up. Liam Fitzgerald is the boy seen on the above viral video shot before Tuesday night’s 2-1 win over the Florida Panthers. What makes Liam, who has Down syndrome, so tough? Well, he was diagnosed with Acute Lymphoblastic Leukemia at age 4. He defeated his cancer in the same way the Bruins took care of business in 2011. It wasn’t easy and it took a while – 3 ½ years in Liam’s case – but he eventually triumphed. “People tell us he’s so cute, and this and that. He was given to us to raise and given to the world to love. He brings joy to people. There’s something about him that draws people him. His smile, his personality. He’s just such a joyful person. He’s taught us a lot about life,” Christine Fitzgerald said. Before the game Tuesday, Liam was given a seat next to the bench. His affection for the Bruins, and their and their affection toward Liam, did the rest. Liam and Bergeron also had their own mini-reunion. Liam is a second-grader at Zeh Elementary School in Northboro. He follows the Red Sox, Patriots, Celtics and Bruins. He’ll watch as many games as his parents allow, always choosing sports over cartoons or movies. His mornings are spent watching highlights on his iPad. Hockey is his favorite sport, hands down, thanks in part to endless knee-hockey games played with his older brother and his friends. “He wishes he could skate,” Christine Fitzgerald said. The Bruins invited Liam and his family back earlier this season, but scheduling conflicts would not permit it. When Christine found out Tuesday’s game against the Panthers, and Thornton, was an option, she and her family happy accepted the team’s invitation. Liam is small physically for his age. But his heart, as Dr. Seuss once said, “grows three sizes” each day. Please share this wonderful story using the buttons below. Great story. Bruins are a classy bunch of guys.